Only at Google. The company known for hiring the best and the brightest and only accepting those candidates with the highest grade point averages and SAT scores has now found an algorithm to help predict which candidates will make the best Google employees. Job applicants will now complete a detailed online survey including questions like: “Have you ever made a profit from a catering business or dog walking? Do you prefer to work alone or in groups? Have you ever set a world record in anything?” (The New York Times). I am a bit skeptical. I do not think that an algorithm is an ideal way to select the right person for the right job. I like to think that we are much too complex as human beings to be reduced to a single number determining whether or not we would be a outstanding employee. 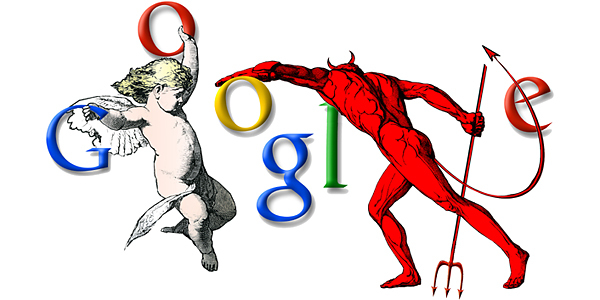 On the other hand, Google search algorithms are the best, so who knows, maybe Google is on the right track. Next in the Google product family: “Algorithmic Dating”, the online survey guaranteed to find your ideal mate brought to you by Google Algorithms. Please do not take this post seriously – it is meant to be a bit silly. As we approach election season here in the United States, political groups go to great lengths to make their favorite candidates look good while making the competition look bad. The latest tactic used is Google bombing, the practice of manipulating Google’s search results to inflate certain results. One of the best known Google bombs resulted in George Bush’s biography page being displayed when someone searched for the term “miserable failure”. If things go as planned for liberal bloggers in the next few weeks, searching Google for “Jon Kyl,” the Republican senator from Arizona now running for re-election, will produce high among the returns a link to an April 13 article from The Phoenix New Times, an alternative weekly. While not illegal, the ethics behind manipulating search results seems a bit questionable to say the least. Rumors were flying this weekend, courtesy of TechCrunch, about Google’s purchase of SpaceShipOne. The recent YouTube acquisition rumor in the billion dollar range also seemed far fetched, and it turned out to be true, so you just never know with Google. Lending additional credibility is the fact that Larry Page is on the board of trustees at the X Prize foundation; however, this rumor turned out to be only partially true. Google seems to have acquired a very realistic looking mock-up of SpaceShipOne. Still pretty cool. I’ll admit it Google has taken over my life, not out of any need to be hip and trendy, but because I simply like Google’s products better than the alternatives. I like Google search because it seems to find what I am really looking for more quickly than the other search engines. I am addicted to Gmail, and I use it not because it is free, but because I like it better than Outlook. Despite owning a copy of Outlook, I have stopped using it for personal mail (I still have to use it for work) because it is consumes too many system resources, and everything about it is just slow. An Outlook search for an email can take minutes instead of seconds in Gmail, and I love using tags in Gmail for those complex topics where filing them in a single folder makes no sense. Google Calendar helps my family find me when I travel. Google Analytics keeps track of my blog traffic. Google Docs provides a place to collaborate with my boyfriend to track household expenses. Google Groups gives my Portland BarCamp Meetup participants a way to keep up with the latest news about our events. I could go on, but you get the point. Security does concern me in this environment, since Google knows more about me than my family, but it is a risk I am willing to take for the added convenience. Like everyone else, I heard the rumors, and I was skeptical. Acquisition rumors usually turn out to be exactly that … just rumors with talks falling through at the last minute or casual talks between companies spawning rumors of impending acquisitions; however, in this case, the rumors were accurate. Google Inc. (NASDAQ: GOOG) announced today that it has agreed to acquire YouTube, the consumer media company for people to watch and share original videos through a Web experience, for $1.65 billion in a stock-for-stock transaction. Following the acquisition, YouTube will operate independently to preserve its successful brand and passionate community. On the one hand, this is a risky move for Google. The copyright issues within YouTube content could escalate now that companies could sue with the hope of making money by tapping into the deeper pockets of Google. On the other hand, Google has never been afraid of a few copyright skirmishes (the book searches and Google news come to mind as a couple of examples), and Google can usually find a creative way to make even very difficult situations work for everyone involved. I will be curious to see what happens.